The Motet 2nd Annual Hometown Hustle! 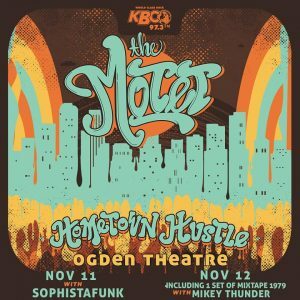 The Motet’s 2nd Annual Hometown Hustle comes to The Ogden Theater for 2 nights November 11th and 12th! Night One will feature support from Sophistafunk; Night Two will kick off with Mickey Thunder and the two set show will include one set of Mixtape 1979, a funk and disco dance party celebrating the music of ’79.